#1 – Make Our Dreams Come True! 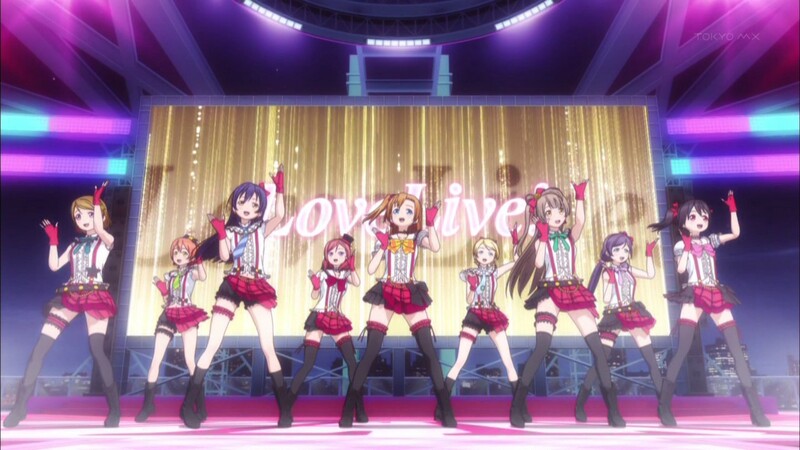 Someone somewhere is already drawing comparisons between Love Live! and The iDOLM@STER. But I think the two shows are distinct enough from each other. 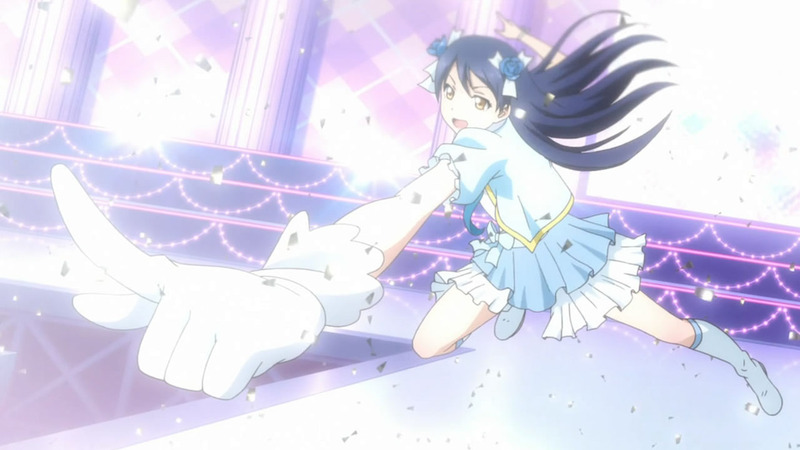 The plot of Love Live! is very simple. Otonokizaka Academy is in trouble. With attendance at an all time low, the administration decides to close down the school within the next three years. Desperate to keep their beloved school from closing down for good, nine girls decide to form a pop idol group. Their goal: become a pop group sensation in order to bring in more students and revive the school’s waning popularity. Right from the get-go, we get a short musical performance to set up the show’s premise. 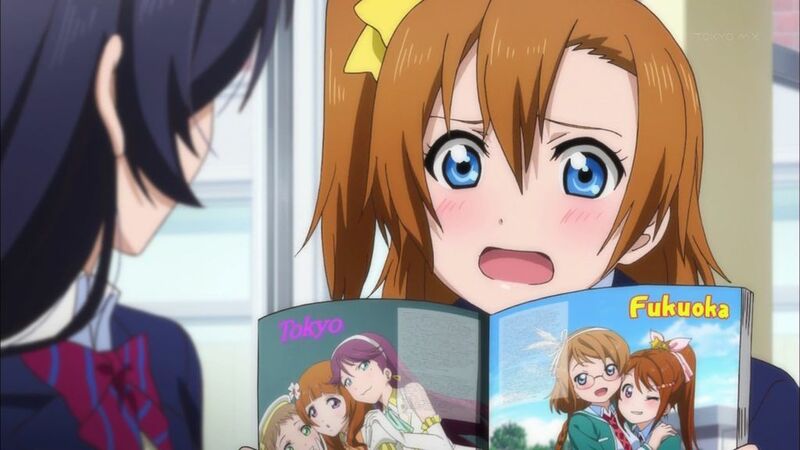 We’re introduced to Honoka Kousaka (Emi Nitta), a second-year high school student who comes up with the plan of becoming pop idols after visiting one of the popular schools and seeing a performance by the school’s pop idol group. Honoka loves her school. She has the same kind of enthusiasm I only wish I had for my high school (Then again, my high school didn’t have a whole lot going for it, and for the most part, wasn’t too upset about leaving after graduation). Her upbeat personality and high energy makes her a very likable lead, and it’ll be interesting to see how far that takes her considering the uphill battle she’ll have to climb in order to become a famous pop idol. The biggest draw of this series is of course the music. And from what I’ve heard so far, it’s quite good. We get three songs in this episode, which range from typical J-Pop to ballads. The performances are great, and the singers can really hit those notes well. I especially liked the piano ballad performed by Maki Nishikino (Pile), whose powerful voice mixed well with the piano accompaniment. The OP for this show also gives us a hint at the big musical dance performances that will pop up more frequently once they actually become idols (Spoiler alert? Well, you know they’re going to be idols in the end). One thing I really didn’t like about the dance performances is the random use of CG. It’s not like the use of CG itself is totally bad, the problem is that it’s not consistent. 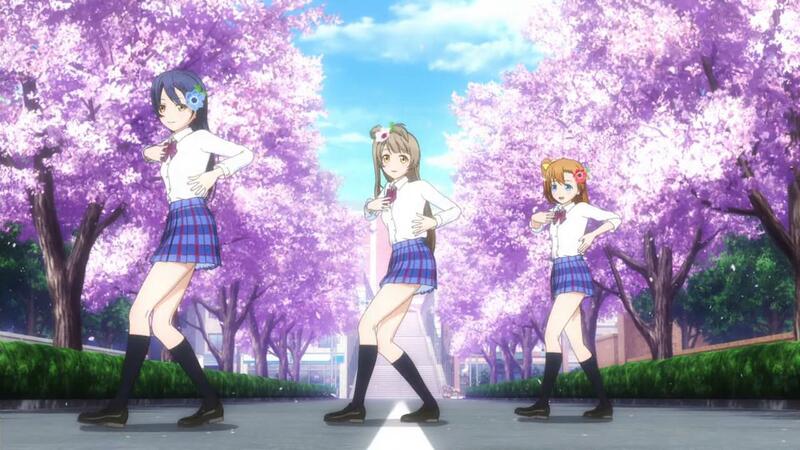 The girls will be CG in one shot, and in the next, they’re 2D again. It’s very distracting, and makes me wonder why they couldn’t have picked a single format and just stuck with it. There were obviously no problems animating the dancing in 2D, so why bother using CG in the first place if they’re not going to commit? Was there only enough money in their budget to put in CG every few shots? All in all, this show is very lighthearted and full of fluff. Aside from the whole pop idol concept, I don’t think comparisons between this show and The iDOLM@STER are necessary, though it’s probably inevitable. So far, this episode did a good job of setting up the premise, and the music definitely shows some promise. If you need your J-Pop and cute idol fix, this show is worth checking out this season. Seriously, KyoAni has money to throw around. Their background scenery alone has been steadily gravitating towards photorealism. Nine girls in the group? Is this SNSD? Do you happen to know what the name of the ballad that Maki sang was? I’ve been looking everywhere and I can’t find it. It’s called Aishiteru Banzai!. There’s a version sung by the entire idol group, but as far as I know, the ballad version sung by Pile in this episode hasn’t been released yet. Thanks! Darn it–it doesn’t sound as good as when Pile sings it herself…Oh well, hopefully one day someone will release Pile singing it. Thank you so much. Pile easily had the best singing in the entire episode, so I hope her version gets released too. I have yet to been able to actually find a picture of this ‘Pile’ person, and it looks like this is her first time voicing over. She’s still really new, and all she’s done is work for the various other “Love Live” video and music projects.